It’s no secret that 3D printing is one of the superstar emergent technologies of 2012. New 3D printers have been announced, crowdfunded projects launched, prices have dropped, and adoption among professionals and enthusiasts alike continue to gain momentum. The promise of a 3D printer in every home lingers on the horizon, though it is likely years down the road. Still tech experts are looking for something that will signal the technology’s best bet to transition from hype to mainstream application by bringing an awareness to the public of what 3D printing can accomplish. Today, one application seems poised to accomplish this. Call it 3D printed figurines, personal miniatures, or photo sculptures — they all mean the same thing: a Mini Me version of yourself through 3D printing technology. Omote 3D’s scan-and-print process produces lifelike figurines in a few days. Now this isn’t a new application of 3D printing technology, but improvements have provided a more realistic-looking and (relatively) affordable product, enough to potentially appeal to the masses. The key to success is finding a niche market that can support a 3D photo booth service, which is a tall order currently. Still, companies are testing the waters by providing the service and gauging interest. Take Omote 3D, for instance, which has been erroneously dubbed as the world’s first 3D printing photo booth. Recently, the company set up a temporary booth in the Eye of Gyre exhibition space in Tokyo that will remain open for two months. Customers can make reservations online to have their 15-minute full-body scan taken via 3D scanning and then purchase a model in one of three sizes (10, 15, and 20 cm) at a price from $264 to $528, though discounts are available for couples and families. Customers can also make final adjustments to the colors used to print their models. The 3D printer maker MakerBot recently announced that it was also opening a 21st century photo booth at its New York City store. Unlike Omote which employs someone to scan customers with a 3D hand scanner, MakerBot’s booth uses ShapeShot from Direct Dimension to convert 2D images into 3D portraits. Scanning takes only five minutes and costs $5. Customers can then take the scan home to print out on their own 3D printers or select a bust or other replica for MakerBot to produce, at varying prices (products are shipped within four to six weeks). The real purpose behind the booth is to show off the amazing technology and encourage 3D printer purchases, such as the new Replicator 2 which runs for $2,199. And what about Europe? Turns out one company has been providing the service since 2010. Madrid-based 3D-U offers photo sculptures (image at top) comparable to what Omote 3D offers in size at slightly less cost, with a 10 cm model priced at about $125 and a 20 cm for $385, though pricing depends on the size selected and the height of the person. Figurines are shipped in two weeks. What’s notable about 3D-U is that its store isn’t a front for selling 3D printers, but is a stand alone center for specializing in the making of realistic figurines. With all the interest building in 3D printing, it’s only a matter of time before a big company starts experimenting with 3D photo printing…and it’s already happening. Along with gobbling up entertainment juggernauts like Marvel Comics and Lucasfilm, Disney has made two attempts this year with 3D printing booths. First, visitors of the Walt Disney World Resort could have themselves “frozen in carbonite” at the Carbon-Freeze Me booth set up for the Star Wars weekend celebration. More recently, the company offered girls the opportunity to become a princess in the D-Tech Me Princess experience. At both booths, face scanned portraits were then printed out in lieu of either Han Solo in carbonite or one of the Disney princesses. Cost for both was $100 and takes five to six weeks to arrive. The D-Tech Me Princess will print a scanned portrait onto the body of a Disney princess. The momentum for 3D printing has really picked up in 2012 and stories about using the technology to produce art, furniture, and even homes is starting to gain much greater exposure. Still, these applications are far from being either mass produced or adopted broadly. That’s why these efforts in portraiture and figurines can bridge the gap and help usher in an era predicted by Ray Kurzweil and others. But how long will it be before 3D printers really take off? 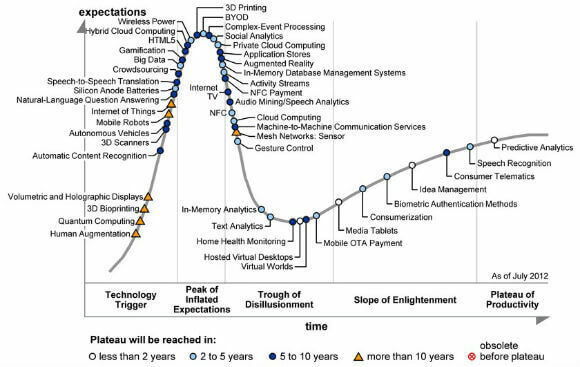 The popular prognostication machine known as Gartner has 3D printing firmly planted at the top of its hype cycle and predicts that it will be another two to five years before the technology moves from the “Peak of Inflated Expectations” to the “Plateau of Productivity”. Whether 3D photo booths can help 3D printing vault into consumers Top 5 Must Have Technologies remains to be seen, but in the meantime, brides and grooms around the world who must have replicas of themselves on top of their wedding cakes have a cool new way to make models of themselves.